The largest international tradeshow devoted to franchising from 25 to 28 March 2018, in Paris, Porte de Versailles Exhibition Centre, Hall 2.2. Franchise Expo Paris is on course for another successful edition with more than 560 exhibitors expected (including over 480 brands), 140 first-time exhibitors and almost 90 business sectors represented. This 37th edition will also be hosting over 150 international brands for insight into the hottest trends and concepts from around the globe. The 35,000 investors, start-ups and retailers who come to Franchise Expo Paris every year are first and foremost looking for a good idea to set up their business or make an investment. With so many exhibitors from a broad range of sectors and international visibility, we are positioned as a global showroom for the franchise business model. The main players in car and motorbike maintenance will be at the show: Feu Vert, Midas, Norauto, Point S, Roady, Speedy and Doc Biker. Trends to note are windscreens (France Pare-Brise and Chrono Pare-Brise) and carwashes (Eléphant bleu and Lav’Car). The electric bicycle segment will be represented by Wattitud and Maa Bikes. “Although this sector usually requires a substantial initial investment, automotive franchises are flourishing due in part to the aging car fleet phenomenon, meaning consumers need to maintain their vehicles year round,” explains Sylvie Gaudy. The major trends in this sector are in home exterior improvement (eg, DSM, Daniel Moquet Signe Vos Allées, Rénoval, Vertige and Agir Rénovation) and home automation. The building sector is getting a fresh boost and riding the wave of new expectations in terms of renewable energy and sustainable construction. Regulations are changing regarding energy transition, so this sector should offer some excellent opportunities,” explains Sylvie Gaudy. As proof of the building sector’s dynamism, two of the three franchises nominated for the Révélations de la Franchise (Franchise Revelations) awards were from this sector, including the winner! Préservation du Patrimoine took first prize for its offer of energy-saving renovations for home owners. With almost 50 exhibitors, up by 160% compared to 2017, this sector is experiencing solid growth and will be represented by key players in the fitness and sports facilities industry: Fitness Park, L’Orange Bleue, Gigafit, Freeness and Keep Cool. Launched a few years ago and now making a comeback is aquacycling (1° Eau Fitness Marima, a concept from Italy, Aquabecool, Swimcenter, and more). And new at the show this year will be a spa and steam room brand called Les Bains de Marrakech. “This is an incredibly exciting and innovative sector that’s constantly coming up with more and more specialised concepts,” says Sylvie Gaudy. 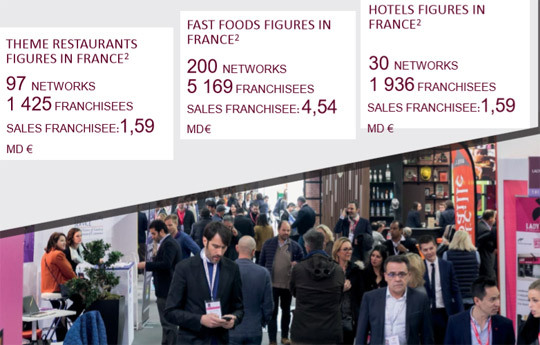 Among the other sectors represented at Franchise Expo Paris (16% of exhibitors) are food retail and distribution businesses, such as wine merchants, chocolate makers and bakery chains (strongly represented this year). Wine still has plenty of momentum, with seven wine merchants offering wine sales in all its forms: Nicolas, Cavavin, Bibovino, Inter Caves, La Vignery, Vins sur 20, and the Russian brand Easy Wine. The wellrepresented bakery concepts (including Feuillette, La Mie Câline, Les Fournils de France, Ange Boulangerie and Boulangerie Louise) and chocolate makers (including Jeff de Bruges, De Neuville, Réauté Chocolat and Des Lis Chocolat) also remain very popular sectors offering sound business opportunities. With regard to food distribution, all the big players will be here: Auchan, Carrefour, Casino, Système U and Les Mousquetaires. Franchising is actually a major growth strategy for the large food groups. Among the most noticeable trends are organic foods and convenience stores, both of which have been expanding in recent years. This sector includes concepts dedicated to all types of entertainment. “In tough economic times, consumers will still spend money on leisure activities as an anti-recession remedy,” explains Sylvie Gaudy. Escape games, video games and karaoke are especially popular. Other concepts such as DIY and creative leisure brands (Mondial Tissus, Singer, Self Tissus) will also be well represented. A total of 35 market players will be presenting their offers, including La Compagnie du Lit, Natuzzi Italia, Interior’s and Carré d’Artistes. Kitchens will also feature strongly, with some of France’s kitchen leaders: Mobalpa, Socoo’c, Schmidt, Ixina, Cuisines Plus, Aviva Cuisines and Cuisinella. More than 20 exhibitors from this sector are expected at the show, including the market's biggest players: Orpi, Guy Hoquet l’Immobilier, Era Immobilier, L’Adresse and Stéphane Plaza Immobilier. New this year will be many businesses offering advice and guidance to home-hunters. With more than 40 brands represented, fashion and personal goods is the show’s 6th largest sector (8%). Brands exhibiting for the first time are Kaporal, Pataugas, Besson Chaussures, Jennyfer, NAF NAF, Grain de Malice, DDP, LPB Woman, Un Jour Ailleurs and O Bag, plus international brands from Italy and Spain. The latest trends in lingerie (Valège, Simone Pérèle) and childrenswear (Bébé 9, Orchestra, Kickers, Z, Kidiliz, La Compagnie des Petits) will also be on display this year. This is not only the show's leading sector, accounting for almost 20% of exhibitors, but also still one of the most dynamic. This year we’re seeing a major trend towards the single-product offer. The crêpe, for example, has five concepts dedicated to it: Ar Poul Gwen, Ar Preti, Framboise, Paye Ta Crêpe and Fête à Crêpe. Also in vogue are french fries, with brands such as Frituur, Queen’s Chips and Frite Alors! World cuisine is popular too, especially from two destinations: Asia, with the Pitaya, Santosha, My Wok and Sushi Wok concepts, and the Mediterranean, with Artespañol, Canas y Tapas, and Couscous Party. South America is also strongly represented with taco brands (Tacos Avenue, New School Tacos) and the Nachos Mexican Grill concept, which was nominated for the Révélations de la Franchise awards, a competition that recognises start-up networks whose distribution concepts or services are the most successful or innovative on the market. The show's second biggest sector, with almost 70 exhibitors (14%), is services for individuals and businesses. This is a very exciting sector with some 20 first-time exhibitors. With regard to services for individuals, childcare is booming. In the business services area, HR/training and coaching services (Action Coach, ISNP, Engage & Grow) work well.